I'm not 100% sure this is the right place to ask this question, but here it goes anyway. I recently acquired set that isn't in anybody's database as far as I can tell. 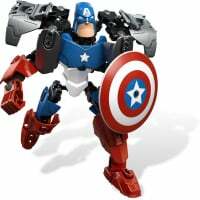 Not here, Bricklink, Peeron, Lugnet or any other site I've searched. Here's what I can tell you. 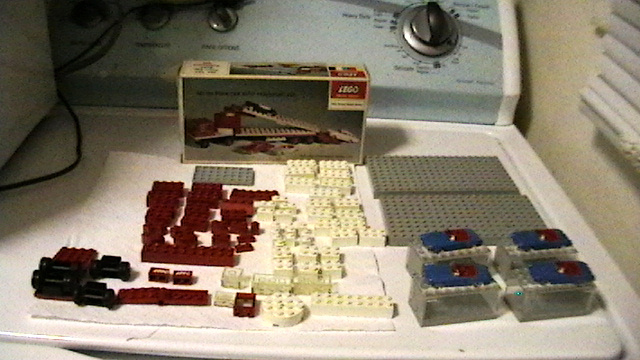 The set I got is a loose set with mostly red and white Samsonite era Pat Pend bricks with a few blue bricks. 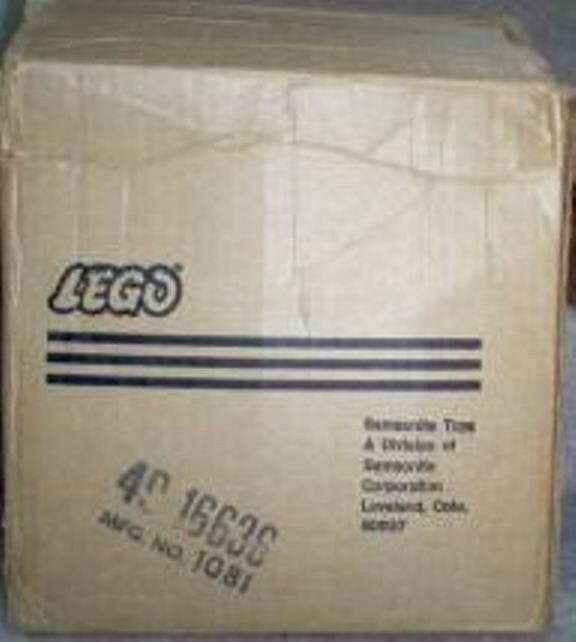 The box is a brown cardboard box stamped with LEGO, Samsonite and a catalog number. And I have a small in-pack catalog for LEGO by Samsonite. It advertises four sets and has Samsonite like instructions on the back. I've tracked the catalog number down to a '72 Sears Christmas catalog. Sears sold four sets that year. A 1047 piece set, a 846 piece set, a 665 piece set and a 395 piece set. Which happens to match the sets advertised in the in-pack catalog. I have the 665 piece set. This is where the trail goes cold. The box is a cube like box similar to the late Samsonite era Imagination sets (101-105). But the part counts are clearly different and as are the inventories. Sets 102-105 all have gears and wheels, whereas only the larger two Sears set have gears and wheels. The source of this information is the in-pack catalog explicitly states that only the 1047 and 846 piece sets have those parts. So anybody have any more information that they can add to this? 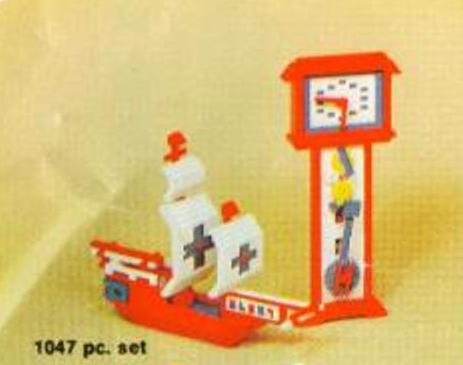 Maybe whoever originally had that set also had the larger sets and you got a mixmatch of several sets? I am assuming you did not open the set yourself or did you? any chance you could post some images of the box and the Samsonite in-pack catalog? Silly question... of course this is the right place to ask this.... lol. There is a chapter in my version 1 (1949-80s) and upcoming version 2 (1949-90s) Unofficial LEGO Sets/Parts Collectors Guide on CD (over 2,500 pages)... that has a Chapter 9 - "USA/Canada Department Store Exclusive LEGO Sets". I am unfortunately missing an image of the 1972 Sears catalog (I have the 1972 J. C. Penney, FAO Schwarz, and the 1973 Sears Catalog)... but I'm missing the one you mentioned. Is there any way I can get a copy of that page from the 1972 Sears Christmas Catalog? 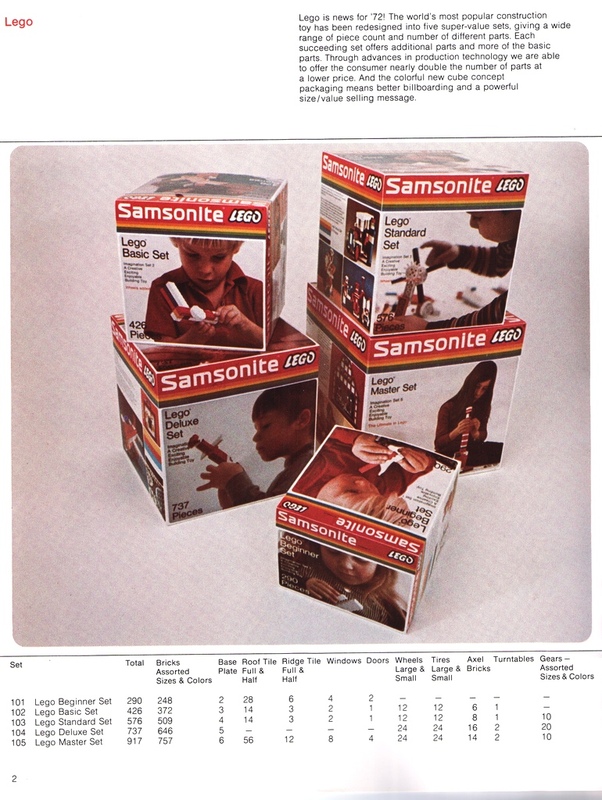 From 1961 until the 1970s Samsonite, the USA/Canada licensee for LEGO sold LEGO sets in the same place that they sold many of their Samsonite luggage sets... namely in Department Store Mail Order Catalogs. The boxed exclusive sets started out by being colorful boxes (just like regular sets). 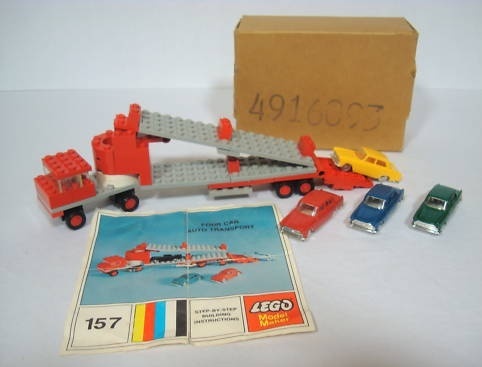 But by 1967 some sets were sold in brown outer shipping boxes, with either LEGO trays inside, or loose parts in the larger boxes. Below is an image of the 1081 piece 1971 Sears large box set. Although Sears (largest mail order catalog firm) had the most exclusive sets that were sold via catalogs, other companies did as well... including luxury toy store FAO Schwarz. However unlike mail order sets by Sears and J. C. Penney, FAO Schwarz sets always came in colorful attractive boxes... since they had the "up market" crowd. Anyway in 1971 and 1972 Samsonite USA already knew their days were numbered for LEGO sales, so they wanted to get rid of all their ABS pellets and LEGO parts inventory. So they sold LEGO (sets 101-105) and also catalog sales in HUGE boxes with parts counts sometimes up to 1250 parts). They were emptying their inventory before the clocked ticked out on their sales. Hence you have these huge square boxed sets in 1971-72 that was allowing them to "dump" their remaining inventory at reduced prices. Now getting back to the brown box versions of these department store catalog sets... there are often 2 numbers on the box. One is the catalog entry number, and the other is a "Manufacturers" number. These 2 numbers often (but not always gave you a clue to either the set number, or the parts counts within the set. In the box image below, the 49-16636 tells me that this is a Sears catalog item (they often start with "49". The Manufacturers number tells me the part count... 1081 parts. But it gets much more complex than that... because sometimes one of the 2 outer numbers references a set number (such as the 371 Motorized Truck Set, or 536 Designers Set), and other times it just references a set with say "301" parts. 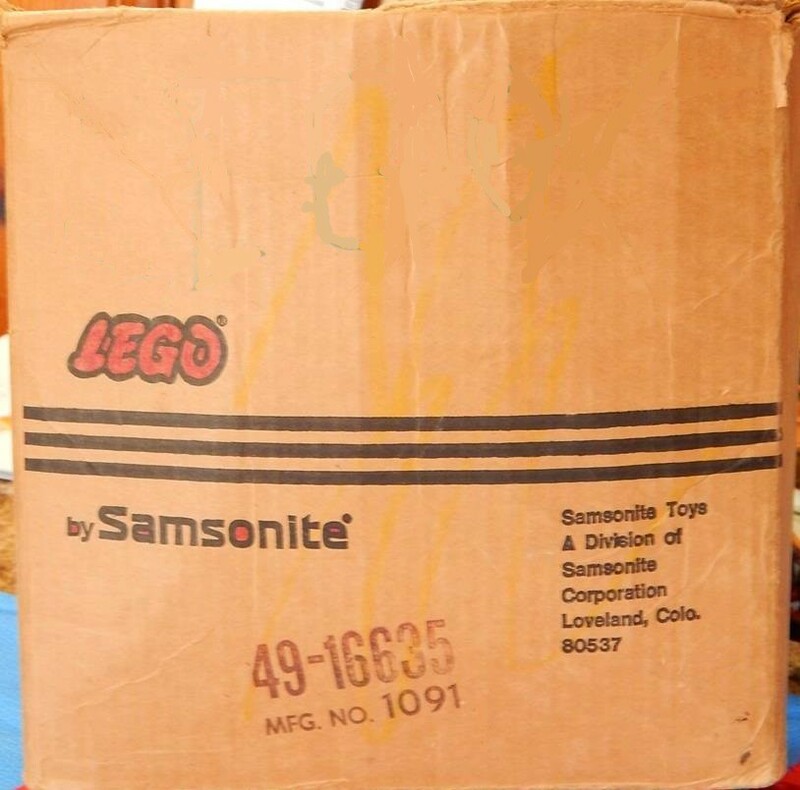 The 2nd image is a "brown box" version of the Samsonite LEGO 536 Designer Set. Here the MFG. NO. is "465361"... and here the "536" identifies it as a 536 Designer Set (which FAO Schwarz also sold, but in a colorful box version). 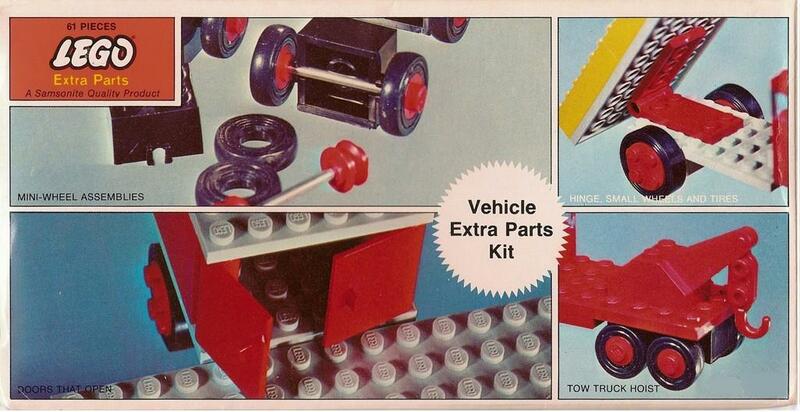 The 3rd image is of another Sears brown box set "463011".... which is actually the 301 piece Wheel Toy Set. My Chapter 9 of my LEGO CD lists 42 Samsonite Catalog sets, half of these were produced in colorful boxes with interesting names (such as the 223 Adventurer Set, the 326 Suburban Set, the 835 Advanced Builders Set), and others came in just brown cardboard boxes with regular LEGO trays inside, or in the case of the large square boxes... just the loose parts. My LEGO CD has over 60 chapers and cover everything from service packs to individual parts sales (in the 50s/60s), to these Department Store catalog sales, to over 80 pictured wooden box sets from 1950-78 (you won't find more than 5 wooden box sets in either Bricklink/Peeron/Lugnet). I've spent many of my 51 years of collecting researching old LEGO (and new)... and even trade information with the LEGO Archive/Collections folks in Denmark. I say "trade", because I've been able to find info that the LEGO Archive folks never knew existed. One last (4th) image is the #080 Ambassador Set, an FAO Schwarz exclusive set (hence the colorful box). 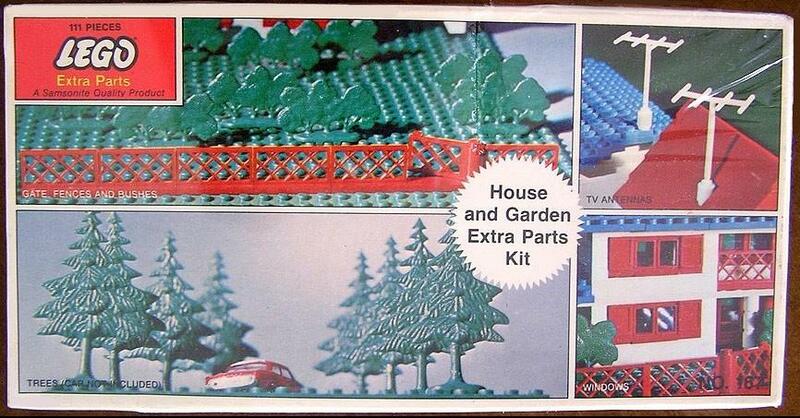 This set was otherwise only sold in continental Europe as the #080 basic set. My Chapter 9 of the CD has 18 pages of images and tables (who sold what) between Sears, Penney's, Jordan Marsh, Eaton's, and FAO Schwarz. But I would love to get a copy of that 1972 Sears Christmas Catalog image to add those 4 sets... (making it 46 mail order sets). So many questions. If I wasn't clear the set was bought as a loose open set with the box. So I'm sure it's a mix and match of parts and pieces. Although all the elements I've looked at are of the right era. Second, I'll try and post a picture of the box and a scan of the in-pack catalog in a little bit. As for the Sears catalogs, they aren't mine, so I can't give you a copy. I found them on a web site called wishbookweb.com. Here are the direct links to the two pages the LEGO stuff is on. First page with text description, second page with image. I think you're wrong about the first image of the square box Gary. Wishbookweb.com has a '71 Sears catalog and item No. 49 16636 isn't in that catalog. 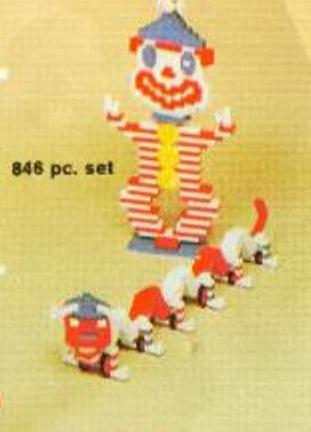 It is in the '72 catalog and is listed as a 846 piece set. The set I have is catalog No. 49 16637 and Mfg No. 1071. 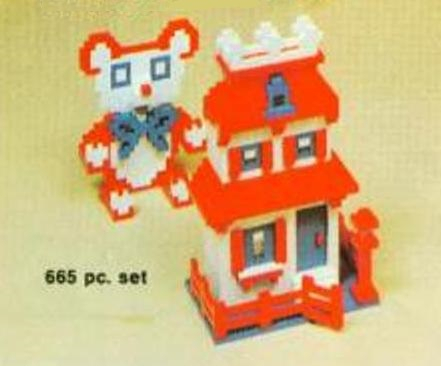 This is listed as 665 piece set. And you don't have sell me on you're CD as I do have a copy ordered. I'm eagerly awaiting it's arrival. I should have known you'd have a chapter dedicated to catalog sets. Ok I've got a couple photos of the box and in-pack catalog here. Thanks LusiferSam... I just learned something new.... that what worked with Samsonite rectangular brown box sets and their numbers in the 1960s, doesn't hold true for their large box sets of 1971-73. With the 1960s boxes usually the manufacturers number has the set number within the series of numbers. But once the big square box sets of the 1971-73 era came out (to dump the remaining inventory), the manufacturing number no longer had any relation ship with the set number, or parts count. Here's 2 images of J.C.Penney. 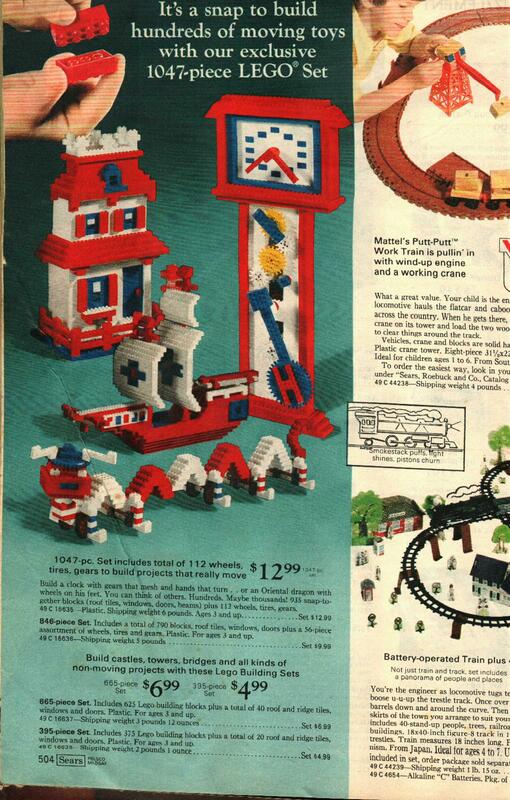 The catalog mentions a huge 1241 pieces set. And also included is an image of the actual box. It too (like your Sears set) has no relationship between the two. 1) You'll be lucky to find any yellow parts, except the Samsonite gears. 2) If there are any classic windows/doors, they'll likely be white. 3) The 1x6 and 1x8 bricks will likely be hollow bottom with cross supports. 4) You may find some white waffle bottom plates in the set in sizes 2x8, 4x8, 6x8, as well as circle bottom plates. 5) You will likely find several different LEGO fonts on the studs of the bricks. These are all to be expected. Back in the mid 1960s TLG sold (or just shipped) USA Samsonite all of their old retired molds for the 1x6 & 1x8 bricks, as well as waffle bottom plate molds. TLG also shipped Samsonite some of their old (worn) brick molds, so you may also find some bricks with more than 1 LEGO font on the studs... and not all will always be facing the same direction. I'm going to float a theory out there, so feel free to burst my bubble here. I'm guess when the boxes for catalog No 49 16635 and No 49 16638 turn up the manufacturers numbers will be 1091 and 1061. Drop the trailing 1s and you have 106, 107, 108 and 109. In 1972 Samsonite produced 8 sets, 101-105 and 110-112. There's a four number gap that 106-109 fits in perfectly. So these might the set numbers. I don't know if works with the JC Penney's sets or not (there's no images or links). It also might just be wishful thinking on my part. It's funny you mention those "anomalies." My Sears "set" has all of those but waffle bottom plates. The 2x8 plates as circle bottoms, the plastic is off. I guess it's that CA mix or some different ABS mix that Samsonite used in the mid 60's with their plates. One look and you can tell it's not "normal." As for the plastic that Samsonite used for their plates.... yes very strange. I have a 4x6 Samsonite circle bottom plate in black that has that "pearly matte" finish that you are referring to with a non-italic LEGO font. The reason the 2x8 plates are like that is that Samsonite AND TLG Europe used the same strange plastic on the 2x8 white (circle bottom) plates that were used as railroad ties for the blue era train track (1966-79). And many of those same plastic 2x8 plates were found in other sets as well. I had a large number of 455 Lear Jet Sets (mid 1970s, USA/Canada only), and each plane came with 7 of those pearly matte 2x8 plates. Tis true.... but apparently Admin Eric and prior to that the late Admin Dan viewed it differently... in fact Admin Dan always preordered the CD's. Maybe they view it in the same sense as the magazines... since it is also print media, in a different form. And interestingly enough... there is a loyal base of folks who have been very patient with their pre-orders (also in the past), since they cannot find a lot of the information anywhere else on the Internet. Interestingly enough, even the LEGO Archive and Collections folks in Denmark (who have contributed many images and information in the past) are big fans of my LEGO CD. I've researched information that they have little (or no) knowledge (or examples) of. This is especially true for USA/Canada Samsonite LEGO sets, and also early Norway and Sweden sets of the 1950s. The Fantasia folks who wrote the OFFICIAL COLLECTORS GUIDE, used an early version of my CD for some information (I'm referenced as a contributor).... and in version 2 of their guide (that includes the eariler 1949-57 years)... TLG often told the Fantasia folks to talk to me about a particular item that TLG had little info on. After looking at the Penney's box I'm not sure if I like my idea any more. I think I'd need to see the manufacture of all of these sets to really make that call now and seems unlikely to happen. Oh well. Again just a theory. So why aren't these sets better known? I mean these sets aren't in any database I've looked. 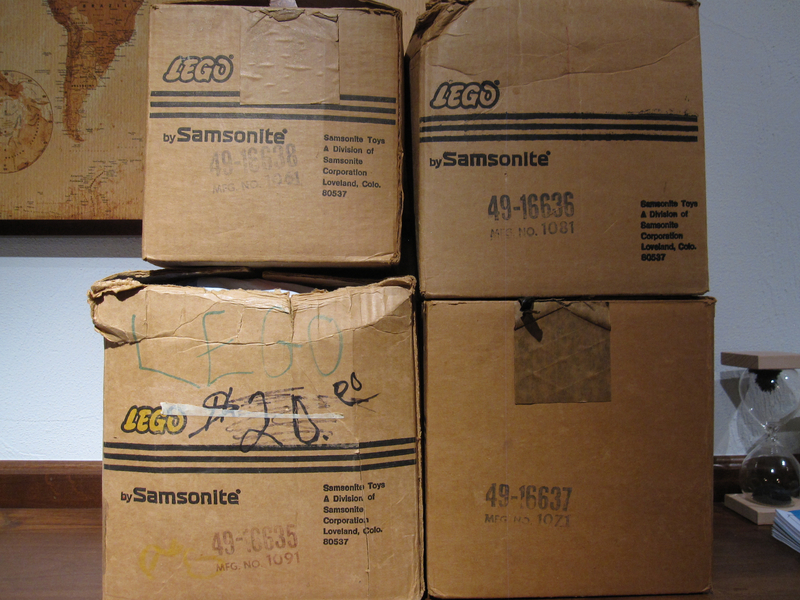 But many histories on LEGO talk about these massive '71-'73 sets Samsonite made to dump their inventory. Is it because this set came in plain brown boxes rather than normally colorful boxes? It seems really quite unfathomable to me that there are 8 (or more) large sets that are nearly completely unknown and unheard of. Particularly when some of these are amongst the largest sets ever made prior to the mid '90s. I cam across this low resolution image of the 1973 Sears Catalog... as well as another of the 4 Sears Mail Order Catalog sets. 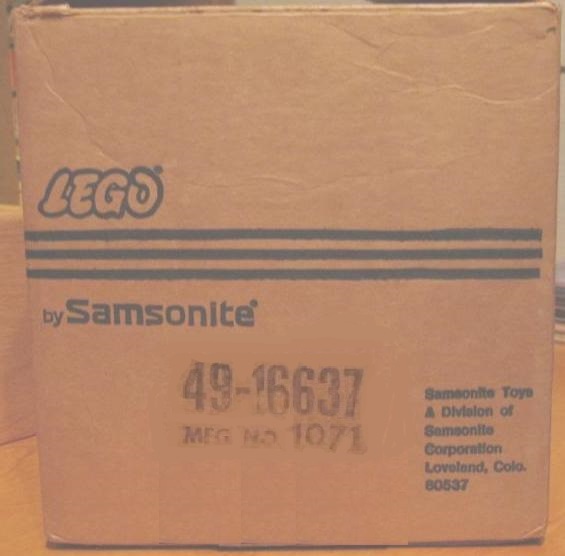 Here's what I see as the case.... it was 1973, Samsonite lost its' license to produce LEGO, so they took what was left over and put it into huge sets. 5 of those huge sets were the 101, 102, 103, 104 and 105, as found in the 1971-72 Samsonite LEGO catalogs. Then as you suggested before the 110, 111 and 112 spare parts packs, they had some number gaps. 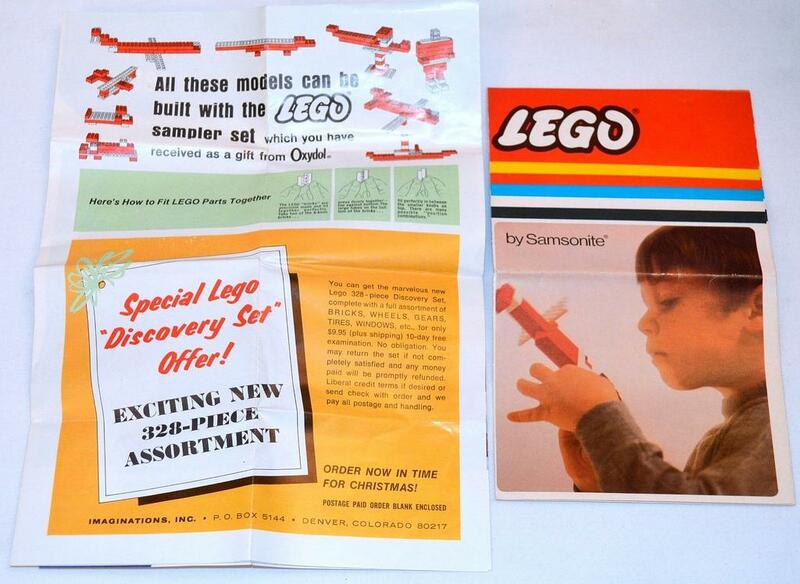 The last of the mail order ccatalogs for selling Samsonite LEGO were the 1973 Sears and 1973 J.C. Penney catalogs. Penney's is a different case, and won't be talked about now.... but the Sears sets in their catalogs were huge sets, just like the regular 101-105 Samsonite LEGO sets. They of course are NOT in any online LEGO database, neither are many other LEGO sets that were mail order sales in USA/Canada from 1961-73. But I am making corrections in Chapter 12 of my Unofficial LEGO Sets/Parts Collectors Guide, to use these numbers as the set numbers. And as you stated after regular Samsonite LEGO sets 101, 102, 103, 104 and 105, they used 1061, 1071, 1081 and 1091 for these sets, before continuing on with 110, 111 and 112 as set numbers. Samsonite did something somewhat similar early on when they took the 605 (Wheel toy), 610 (Double Wheel Toy), and 905 (Doll Set)... and made Sears versions of them under the 1605, 1610 and 1905 numbers. 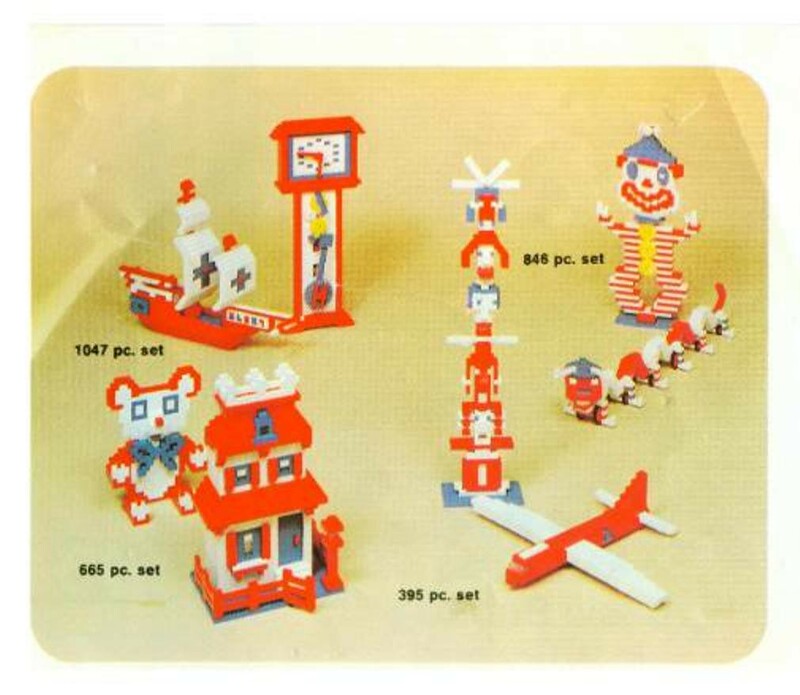 Although some sets were sold mail-order in a colorful box... such as the FAO Schwarz (luxury) Toy Store sets. And some sets were sold in-store in a colorful box, as well as thru mail-order in a brown shipping box. Of the 52 Department Store LEGO sets in my collectors guide Chapter 12 - Department Store Exclusive LEGO Sets, 22 come in colorful boxes, and 30 come in brown cardboard shipping boxes. Well that's cool. Now I'm curious about the JC Penney's sets. That's not exactly true. Using my own research and taking some cues from your Guide I offered to helped Huw update and correct Brickset's Samsonite sets. So in addition to correcting the dates on 101-105 and 110-112 sets, I had Huw add everything I knew of from '65-'72 which included many of these catalog sets. If you're pretty sure about the Sears numbers I think it would be worth while having Huw do another correction. It's funny how the yellow and black LEGO elements were pretty much depleted by this time (except for the yellow Samsonite gears). None of the models show either color. These sets are in the Brickset data base, except for the two smallest, which have the same part counts as the 101 and 102 regular Samsonite sets. I don't ever recall them being in a brown box format, so these may just be the regular colorful ones. But who knows if they too will one day show up at auction. What really amazes me is how few folks are into the truly rare LEGO items. Everyone and their brother wants the CMF Minifigs... and they're likely made in quantities that make Beanie Babies seem rare.... but I find that a lot of old time collectors have been hoarding up the truly rare LEGO items at bargain prices. Such as this a rare 1971 Sears exclusive 157 4 CAR AUTO TRANSPORT..... for less than $23.... wow!! People probably saw that they were Minix cars.... and thought it wasn't an original set. What they don't know (as I mention in my collectors guide) is that 3 Samsonite sets used these when the 1:87 LEGO cars ran out. This buyer got it for pennies on the dollar... and the box is in magnificent condition. Granted it's the later version (after Samsonite ran out of the 1:87 LEGO cars and replaced them with UK Minix cars)... but it's the in store version, and not the brown box mail-order version. The new owner of this set already has 4 of them... but couldn't resist the bargain. 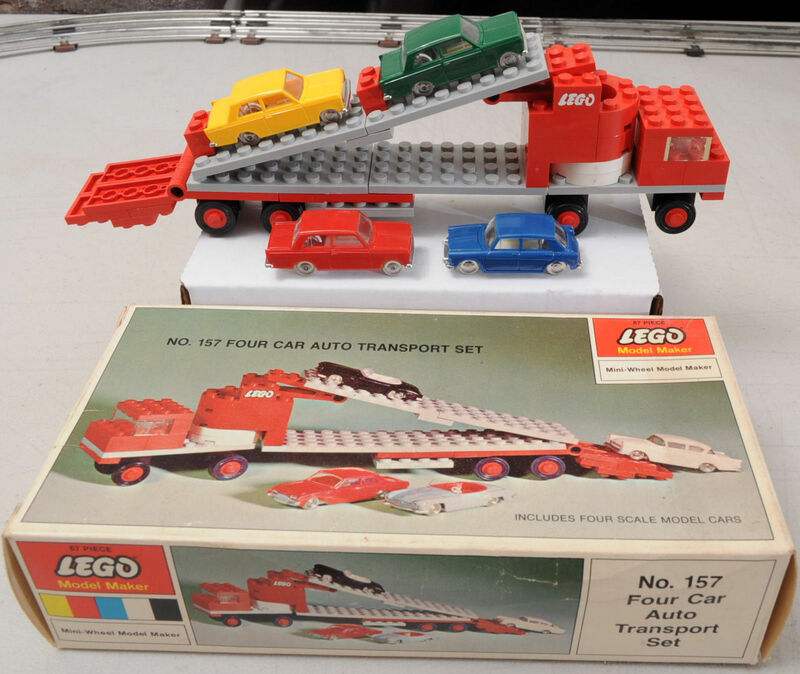 Here's an earlier example of the 157 set with LEGO 1:87 cars (4 of the 266 Mercedes 190SL convertibles in their garages, which ironically also were included in the set). Now this version could be worth quite a bit more, especially if the cars were in mint or near mint condition.... maybe $200-$300 more depending on the condition of the car. And while I'm at it... here's the brown box (Sears Mail-Order) later version with the Minix cars... That would leave a 4th variation of the 157 that exists, with the LEGO 1:87 cars/garages and a brown box. I've had many a seller ask me to talk to the buyers about these anomalies. I rarely like to talk about the prices that I pay for stuff, as I feel it's nobody's business but my own, but I am the buyer of that particular 157 set. I am truly dumbfounded for how little it went for. To the point where I actually feel sorry for the seller. On the other hand it's incredible deal. The only downside is there are no instructions and those may be hard to come by. I knew exactly what this was when I saw it and understood precisely what was going on. If other people didn't know or thought this was a fake or a substitution, it's their loss and my gain. I have a little bit of additional information for you about the JCPenney sets. Last year I bought the 857 piece JCPenney set. Or more accurately the box, as it was a loose and opened set. Manufactures number is 1932. I can post a photo later if you want. Now I've seen 72 JCPenney's catalog image floating around the web for a while. But I've been unsure where it originated from as it's clearly the same scan the just keeps getting recycled. And I've strained my eyes staring at 73 Sears catalog image any number of times hoping that a better one would pop up online so I can actually read it properly. Thanks for the feedback LusiferSam, and yes, I could use an image of the 857 (1932) J.C. Penney set. Most of the Department Store catalog images I've seen is from a website that has a huge number of catalogs, but unfortunately none from 1973. 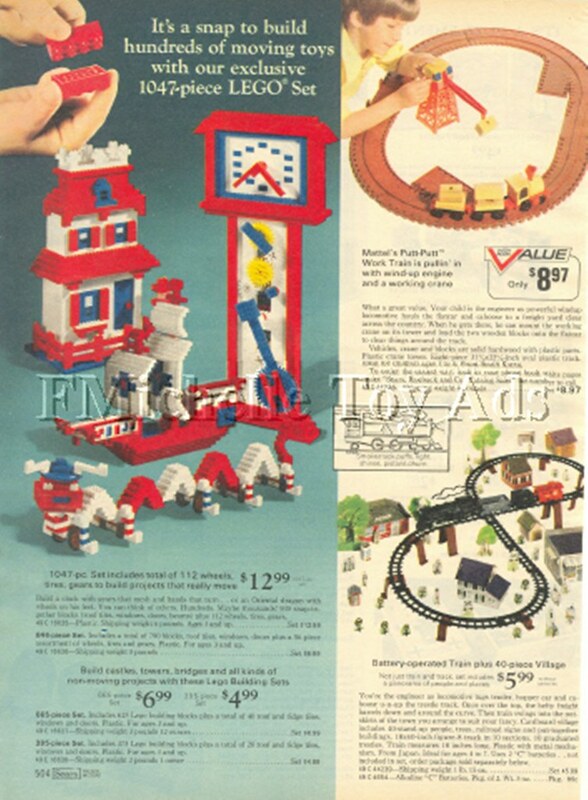 That low res image (above) of the Sears page was from an Ebay auction, IIRC. It's always exciting finding a department store catalog that we've not seen before, trying to figure out which sets they are. Most of the Canadian catalogs contain sets that are regular retail store sets, but they sometimes have one that is a surprise. Also, some of the USA department stores sell only regular sets, such as Bon Marche. But Sears, J.C. Penney and especially FAO Schwarz never fail to deliver really interesting sets. Ok set a photo of the box. It seems like I've forgotten some the details of this thread. Gary already had a photo of the 857 piece JCPenneys set. Another one won't hurt anyone. I've thought about buying a '73 Sears catalog off eBay an number of times. But the price is always too high for what I want for. I don't know about you but $75 or more is too much just to get a clearer image of a single page. The end of the Samsonite era is one of those areas that has fascinated me for a while. Samsonite as a whole is interesting just because it is so different from the rest of the world. Thank you LusiferSam!! I agree about the fascination about Samsonite! For me it was even more personal... 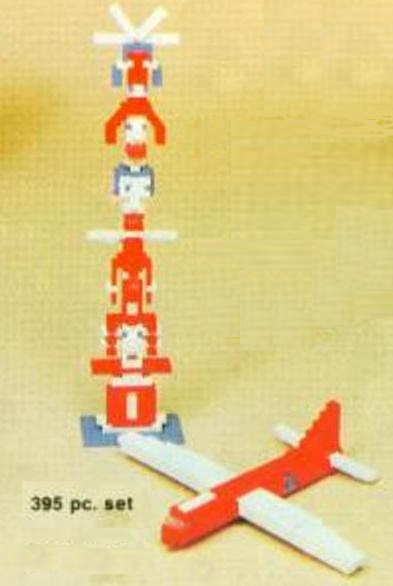 I grew up in the 1960s, and these were my LEGO sets (especially the years 1961-66). 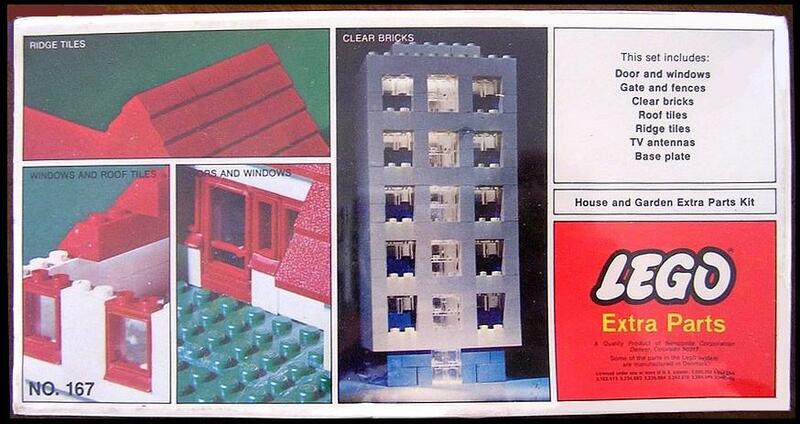 My biggest LEGO disappointment in life was that the 717 Junior Constructor set with the gable roof was never produced... I wanted that set so bad... but had to settle for the flat roofed version. One other point I wanted to make... the 1971-72 regular Samsonite sets.... I do believe that the 110 (Vehicle Accessory Pack) and 111 (Building Accessory Pack) were never produced. I believe that only the Sears versions (166 Vehicle Accessory Pack and 167 Building Accessory Pack) were produced not only for Sears, but in place of the 110/111 for regular retailers. I have never seen, nor do I know of anyone who has a 110 or 111. Yes the Brickset database shows 3 of them in people's collection... but I do believe that those are listed in error... and those owners may actually have one of the other 2 sets under each number. There are no owners listed in the Lugnet Database, and no images there, nor in Peeron nor Bricklink shown. I just think that Samsonite decided not to bother making these sets, once the Sears versions were introduced, since they were losing the LEGO license after 1972 anyway. The 112 40x40 stud baseplates however were indeed produce. P.S. Even in my LEGO collectors guide I used 166 and 167 images (the back of the box)... thinking that a 110 and 111 would one day show up where I could replace the image.... but that's been so many years ago... and no 110 nor 111 has yet been located. Sets 166 and 167 are actually what got me interested in the Samsonite sets. My first foray in the Samsonite set were some incomplete set I had picked up over the years. I was trying to complete 310 Motorized Truck I had bought and found a lot of bricks on eBay that looked to have many of the parts I need. I didn't really pay attention to the size of the lot, but more the price and the parts. So I got this lot for $100, including the shipping. It turns out that lot was 30 lbs. of old bricks. Almost none of them were useful for completing my 310 set. In addition to the bricks two box were included, 166 and 167. This started me on a journey to understand what I had bought and what went where. I'm still decrypting this riddle. There was a lot of random stuff. More than half the bricks are red sloped pieces. There are those odd pearly plates, tons of red cross bricks, wheels and windows galore. This in turn led me to getting more Samsonite sets and to start my own research into them. I can't say I've learned anything you haven't already learned or known, but I've enjoyed it. The major thing I've learned is to be very cautious of Peeron and Bricklink's inventories for older sets, as many are wrong or incomplete. So the 157 Auto Transport arrived last week. Over all the set is in great shape. The Minix cars are beautiful. I'd personally rather have Lego cars, but I've rarely seen Lego cars in such great shape. The pieces are all period correct and seem to be in good and not too dusty. The printed bricks and gray waffle bottoms are good. And tires are all intact. The box is slightly dented, but otherwise very good. The only thing missing are the instructions. Those are likely going to be a real pain to find. Looking back over Gary's posts about 157, I'm reminded of brown mailer box I bought last year. It had four 1:87 cars with garages and a mix of gray 60s era plates. I'm wondering if that might be a very, very incomplete very of the 157. I may have to dig this box out and look at it again. I finally managed to find a '73 Sears catalog that was cheap. 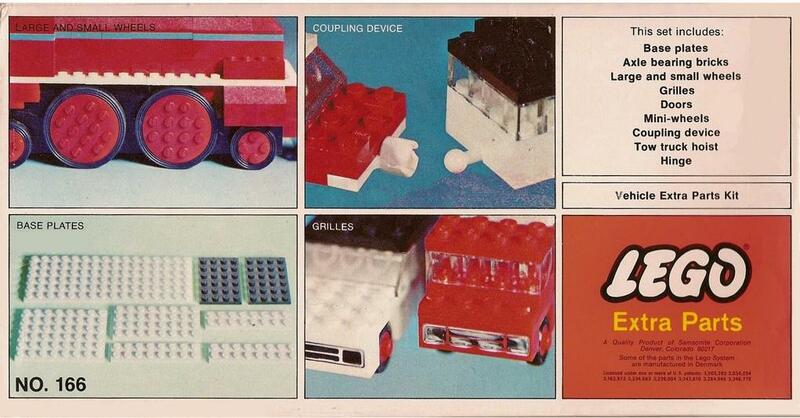 The page with Lego has a bit of odd fold on the one corner, but I'll be trying to scanning later this week. There's no new info I've gleamed out of this so far, but it's good to have a better image of this source. The only difference I've seen is the catalog numbers are 49 C 1663X in '73 vs 49 N 1663X in '72. Ok here's the catalog scan. It's not as good as I'd like, but it's better than we've had before. I'll work at getting a better one made. Are those lego bricks smaller then the standard? The photos of the sets aren't to scale with the hand holding the 2x4s. Those would be some giant man-hands! I was rereading your comment about the 101 thru 109 set numbers. If these 4 brown box sets were 106 (385 piece), 107 (665 piece), 108 (846 piece), and 109 (1047 piece).... they would follow the ascending part count at 106... but the 101 thru 105 sets already have an ascending part count (290, 426, 576, 737 and 917 parts). Sears was likely Samsonite's best customer for most products back in the 1960s, and LEGO was likely included in that. So including these sets in part of that set number listing makes sense. 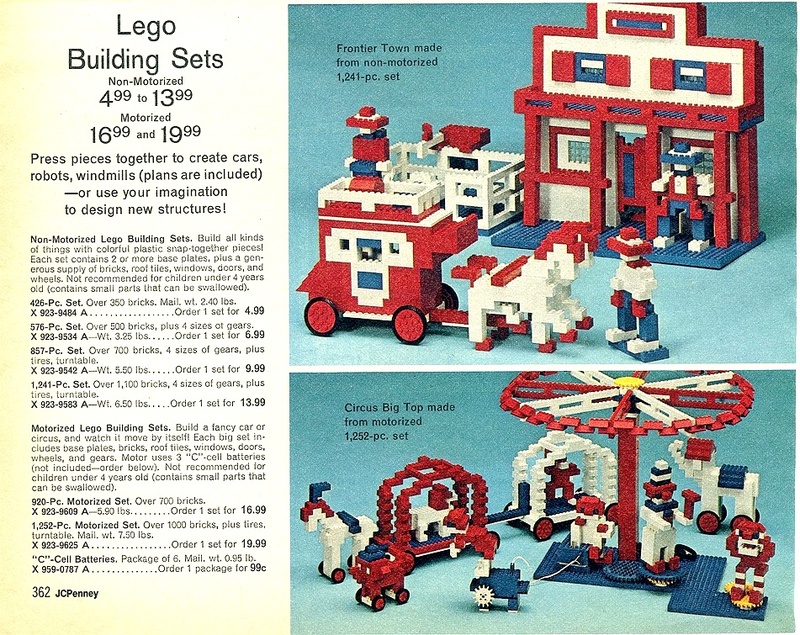 Like with the "in store' sets 101-105, the 106-109 sets may have been mainly for mail order, but only for Sears. J. C. Penney's likely had a similar series of mail order sets such as the 106-109, while the 101-105 were found in store. Istokg for whatever weird reason I've been having trouble scanning it well. If I have time before Sunday I'd try again and send it to you. Otherwise it will be after the 4th. In the mean time this Oxydol set is interesting. Sounds like it might be a mailer version of 005. The name and piece count are right. The mailer box would be interesting to see given that fact the 005 has two trays. @LusiferSam I'm trying to dig up more on that very obscure Oxydol set... unlike these others which were mail-order sets... this one was a mail-order promotional set in a brown box. I may have a copy of that box somewhere... still looking. I think that with the LEGO parts all being red, white and blue, I believe that Samsonite stopped ordering ABS pellets of the colors they ran out of (yellow, green, gray). The only yellow parts were the 2nd smallest gear size. That unique (no 2 sets the same) #695 Bulk Pack is likely how USA Samsonite got rid of their miscellaneous extra parts. By 1971-72 only white windows (mainly 1x2x2) and the 1x2x3 white doors were left in inventory in the general sets. Well it's been seven years since I started this thread. I've been searching for these Sears and JC Penney's '72 catalog sets. The JC Penney sets have proven to be far more elusive than the Sears sets. I finally found the last of the Sears '72 catalog sets and can confirm that the 395 piece set, catalog no. 49-16638 and MFG No. 1061 are the same set. I'm still on the look out for the JC Penney's sets. I really want to know what the MFG numbers are on those sets. Thanks for bringing this one back from the dead. I missed the thread the first time, nice reading about the sets from the days when the internet was a few hundred pages delivered to Mom's mailbox. I too am glad this thread got resurrected, it was a fascinating read! A great read indeed! Thanks! Thanks for finding that set with the Mfg. # 1061 Sears set @LusiferSam!! I had images of the larger 3 boxes (1071, 1081, 1091), but not the 1061. My package arrived yesterday. So here's a family portrait of all four 72 Sears catalog set boxes. I had forgotten the 1091 box was a bit bigger than the 1071 and 1081 boxes. I wasn't sure if the 1061 box was going to be the same as the others or if it would be smaller. But this answers that. @Istokg I've got a good close up of the 1061 and a better image of the 1081 boxes if you want them. Your 1071 image is from me and the 1091 is the same box, just a different side. Looking the contents of my package has been interesting. There's a mix parts/sets in there. There are a elements Samsonite never sold or came out after 1972. I could easily pull out an incomplete 560 based on the rare parts. Most notably the S-21 brick. The other set I suspect is mixed in is 196. There's a maxi-figure and some spoked wheels as the rare parts. Nearly all of the rest that don't belong to 1061 seems to fit with this sets. That takes care of all but two elements I doubt belonged to the original 1061 set. As an unsealed set I know you'll never get an accurate or complete inventory. And given that the other two sets I've identified are incomplete, it's safe to assume 1061 is incomplete. I do have a theory on the inventories of the late era Samsonite sets, but to date have yet to make the math work. So it's not worth sharing at this point.